Yawkey Club of Roxbury member, Alton, spoke at House Party 2018. Alton has been a member of the Club for over nine years. 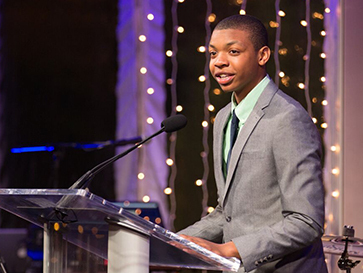 Learn more about Alton’s story and how the Club impacts his life every day. “Over the years, I have grown into a young man, leader, and scholar because of the countless opportunities the Club has given me. I don’t know how many of you have been to the Yawkey Club, but since I was six years old, I have walked past the same oak tree with its painted bench, buzzed through the front doors, and proceed to make my rounds through the Club to all the staff. Back then, I ended my rounds with homework in the education room, today I end them coding with robots in the Technology Clubhouse. I am grateful for Mr. Josh, and all the leaders and advocates of Boys & Girls Clubs of Boston, for choosing me to represent this amazing organization tonight. I am proud to be an example of how support to the Club gives members like me wonderful opportunities in life. The Club provides me with the tools and resources to be a leader. At Yawkey, I am a member of our Keystone Club, a nationally-recognized leadership group for high schoolers. Keystone provides opportunities for me to bring awareness to problems in my community, and together we create solutions through community service and volunteering. I live and breathe Keystone. Through the leadership program, my passion for community service blossomed and I have already completed 387.5 hours of community service since September. I dedicate myself to making positive impacts in my community and it is a key part of my success. Last year, I attended the week-long Historically Black Colleges & Universities Tour, where we drove down the east coast to see some of the most prestigious and renowned HBCUs. Before the trip, we prepared by taking classes and learning about the schools. When we arrived, I was amazed by what I saw: the magnitude of success for the students there, including Yawkey Club alumni, allowed me to envision myself being successful in that environment. The trip opened my eyes to the importance of college and higher learning, and my goal is to attend Howard University in Fall 2021. As a student in the METCO program, I commute from Boston to Weston every day to receive my education. But through the early mornings and the late nights, I continue to make sure I still get off at that same oak tree on Warren Street. This year, in my first high school basketball season, I was selected to play for varsity, and in the last half of the season, I was thrown into a starting position. I was humbled to play for my school, but I had to sacrifice my time with the Club. This spring, I was looking to play lacrosse for my school, and hopefully, fulfill an open spot on the varsity squad. But I could not imagine missing another season away from the Club – missing time out with my friends and my mentors. Though the Weston lacrosse program is definitely missing me, I think I made the right choice. Help secure better futures for members like Alton. Give today.